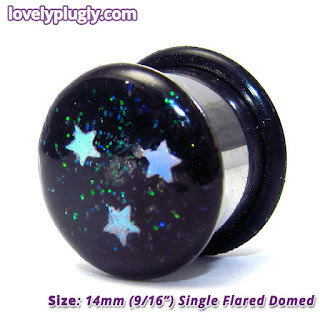 As it's World Space week from 4 - 10 October, we thought that it would be nice to do some more stuff with space things and plugs, so we made these glittery, starry Space is the Place plugs. A deep, layered field of colourful stars with bright flashes of colour. Choice of colours. Available in 8mm (0g) - 24mm (1" Small). 10.5mm (3.8") or 12mm (1/2") long, depending on batch.